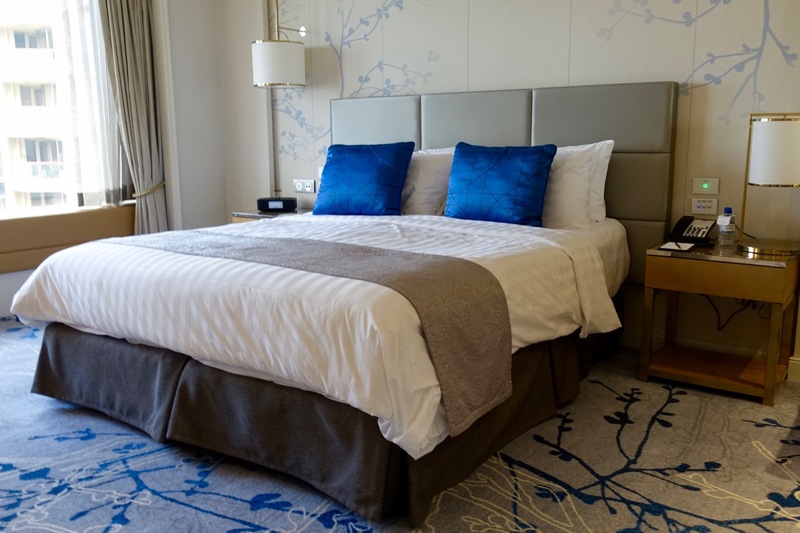 There a few partnerships that Velocity Frequent Flyer Members can take advantage of to earn Velocity points for hotel stays, both domestically in Australia and beyond. This post is intended as a brief overview, a guide for those who didn’t realise you could also earn Velocity points from your hotel stays and want to know the basics. There are three portals that offer Velocity points for hotel bookings, so which one earns you the most? At the start of 2017, Virgin Australia introduced a new partnership with Kaligo and tweaked its old one with Agoda. That’s on top of being able to book through their own portal too. Careful: prices and earn rates differ between all three. To analyse the partnerships, I compared how much five hotels in Adelaide would cost on a random weeknight in March 2017 and found that Kaligo offered the cheapest price for three of them and Agoda two of them. But Kaligo comes with a catch – you have to redeem Velocity points as well. Offers a solid earn rate and quite competitive prices but they tend to be higher than booking directly. If you can hold off to book between 15 September and 30 November 2017 (for stays even after that date), then you’ll earn triple Velocity points on your booking/s. Read our experience of booking through Agoda PointsMAX. Offers a flat 3 Velocity points per $ spent, but usually has higher prices than the other two portals listed here. Offers 3 Velocity points per $ spent on the cash component of a hotel booking, but you also have to fork out 4,000 Velocity points for the redemption in the first place. 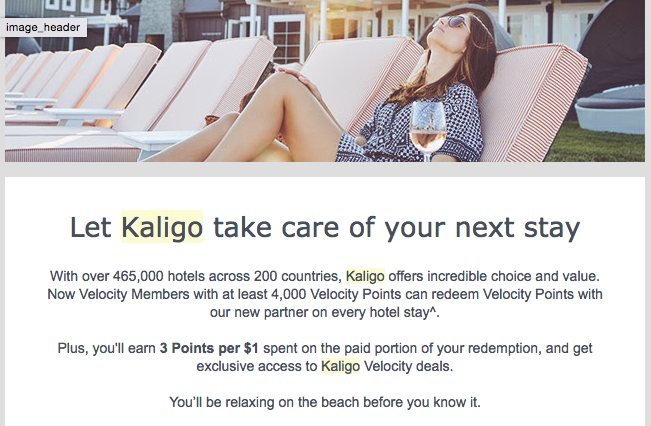 Kaligo’s offering does not represent great value as, according to our target redemption value for Velocity points at 1.9 cents, Kaligo’s pricing would need to be more than $76 cheaper (4000 x 0.019) than the other two to make it worthwhile parting with your points. I see didn’t a price discrepancy this big when comparing between the three portals, and the 1.9c target is the lowest you should go for when making a redemption in my view. Make sure you do a comparison between all three portals – Agoda PointsMAX, Virgin Australia Holidays and Kaligo – but if you are stuck on time, chances are you will earn the most Velocity points from Agoda PointsMAX. Velocity Frequent Flyer has partnered with a number of hotels and resorts in and outside Australia. If you book directly with one of these partners, you’ll earn Velocity points for your stay, if on a qualifying rate. To earn points, show your Velocity membership card during check-in or add your frequent flyer number to the hotel booking over the phone or online before your stay. In many cases, if you know you want to only earn and keep Velocity points and aren’t aiming for hotel program status, you would be better to earn Velocity points directly into your Velocity account rather than target hotel programs. Some exceptions to this might include specific hotel bonus promotions to earn you points from your stay in the hotel program. Earning Velocity points from hotel stays isn’t hard. In fact, if you’re loyal to Velocity, you’d be silly not to try and book your hotel stays in a way to maximise your points. There’s a large range of Velocity and hotel partners to take advantage of and, as always, do your comparisons and sums to make sure you’re not missing out on a better cash deal by booking elsewhere. Where do you think I might be able to find more information about this statement in the article? Also worth considering is the fact that if you have a booking with Virgin flights there is a link on the bookings that gives you 8% off – this also works if you call them and quote your bookings reference – and yes you get bonus points for silver, gold & platinum members – we just booked for 2 hotels in Hawaii cheaper than on the hotel websites – they weren’t showing on the Holidays website but when I called they were very helpful and booked it on the spot and included the discount and logged the discount. This article needs a further update – Agoda is no longer partnered with velocity to give any points. Thanks! Yep, we’ve added that to the status box on this post. My points claim through Vibe hotels claims was rejected by the hotel. Booking is under my name and I am the one that stayed at the hotel. Anyone know if there is a rule that stipulate that I must pay for this myself? I’m pretty sure the Agoda/Velocity points earning no longer works. There is a small note on the Velocity website. When logged into Agoda, the PointsMax Velocity option is still there, however, from when I tried it in April, it seems that I have received no points. 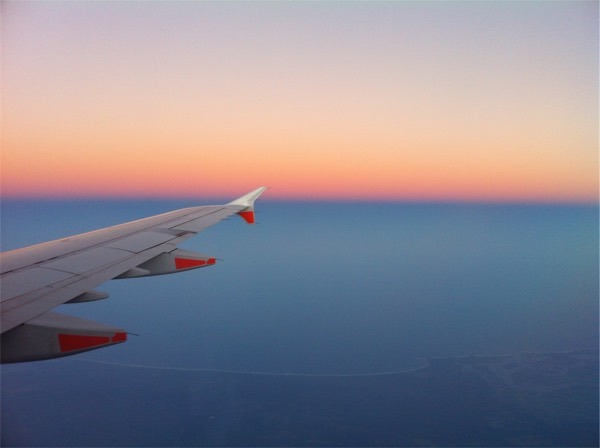 Do you know if the Virgin Australia hotel bookings count as purchases with Virgin Australia? To get the 3 points per dollar on my AMEX as well as the 3 points (or more depending on status). So for me would I get 7.5 points per $1? 3 from my AMEX, 3 for the booking and a bonus 1.5 for being a silver velocity member? Kaligo’s value to velocity members (and what I use it for) is earning Singapore Krisflyer miles. I find singapore redemptions are the best use of velocity points and you can earn miles without the transfer penalty. With Virgin Australia Holidays you can earn up to 6 Velocity points per dollar as long as you are Platimum. Turns out the Agoda/Virgin agreement has been silently discontinued. The Agoda link above no longer works. You wouldn’t earn any other rewards or points like Agoda Rewards if you’re booking through PointsMax. Value comparison would depend on the hotel booked, number of points earned with a few different options – not to mention the non-Agoda option. It’s complex and would change from booking to booking. Not to say we won’t look at it though, I just haven’t thought through exactly how to represent and compare at this point.